Last time I was in Zambia I had the enormous privilege of visiting Machaworks, home of one of the most interesting IT-led NGOs I’ve ever come across. I was shown around by a lovely chap named Elton, who took me out to see where cybercafes have been built into old shipping containers and dropped into villages in the bush as part of rural development projects. Elton is one of the nicest people I know, and I’ve been able to write about the amazing work he does for both the Guardian and Linux Format. 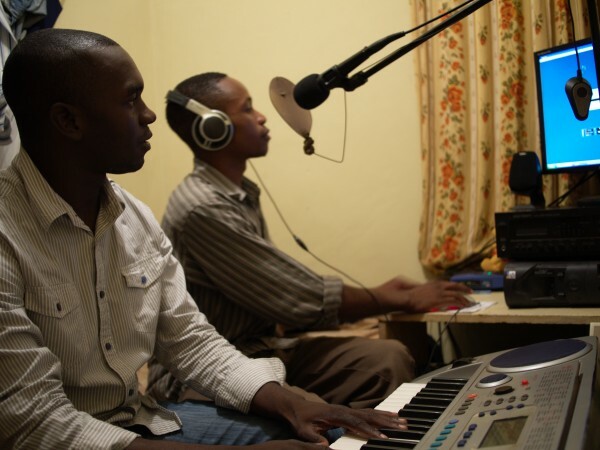 As well as leading a lot of the technical side of Machaworks’ projects, he has a truly inspirational hobby – over the last four years he’s put together a rudimentary digital recording studio based around re-used PCs and borrowed instruments to record the music of the local villages before it dies out. Hopefully, history will record him as one of the great archivists of our time. Saving up the little money Elton earns from Macha, he’s also bought himself things like an external hard drive for back up and a compact camera, which he’s used to set himself up as the first videographer in Macha. He records friends weddings and other special events, then edits them together using open source software like Openshot. To me, Elton is the embodiment of how IT can be used as a tool for international development. So often, IT is seen as a magic wand which can be waved to make poverty go away. So often it fails. In Elton’s case, and that of Machaworks as a whole, it’s a device for personal empowerment and helping to radically modernise communities that have otherwise been left to slowly devolve back to the dark ages. Except that on Friday night, the worst thing in the world I can possibly imagine happened. Someone broke into Elton’s room – one of ten or twelve identical chalets in a small brick outbuilding – and stole everything he owns. His netbook, his camera, his recording and editing PC, microphone and – most crucially – his external hard drive with all his recorded music on it. To make things worse, they also took other machines he’d borrowed from friends, and a synthesizer keyboard on loan from the local church. The monetary value isn’t huge, but it represents years of hard graft and savings, as well as the trust others had placed in him personally. Elton, naturally, is devastated. I feel utterly powerless to help him – there’s some kit in my office I can ship to him to help replace what’s been lost, but as I say, it’s not so much the equipment as what was stored on it and what it represents that’s really been lost. I know Elton – I know that he’s already picking himself up and trying to figure out how to get back up and running again. And there’s plenty of amazing people in Macha who’ll be only too happy to help him out. But it’s truly heart breaking that this has happened. So if you’re in Zambia and someone tries to flog you a second hand camera or hard drive, at least have a look at it to see if it might be Elton’s.